So we lost this past Saturday night against Lafayette in our (Football) season opener. 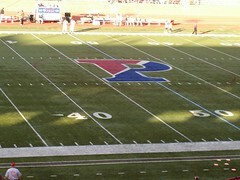 Per pennathletics.com, "In a game that was marked by stout defense, the Penn football team dropped its season opener to three-time defending Patriot League champion Lafayette, 8-7, Saturday night at Franklin Field." To be honest, generally I'm not a huge football fan, however going to a Penn football game had always been special... Thinking of it brings back memories of tradition, community, bitter cold days, congregating outside the stadium to try to get last minute tickets, toast, keys, the Penn band, and oh yeah ...the game.